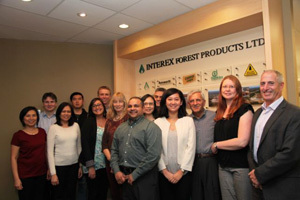 Our Team | Interex Forest Products Ltd. The staff at Interex is a dedicated group of professionals committed to serving the companies we represent and the customers we supply. Our role begins with marketing and sales of established or newly-created export programs in overseas markets and follows the supply chain requirements from our mills’ delivery points to our customers’ destinations in the market. We provide timely and complete export documentation using custom-designed software. Our Sales and Marketing team’s collective experience ranges from forest resource management to OSB Panel and lumber manufacturing (in North America and Asia) to remanufacturing to logistics. We understand the forest products we market and how to get these products to our customers’ door. We can also provide an evaluation of export programs for overseas markets and the requirements to service them.